ox•y•mo•ron n. A rhetorical figure in which incongruous or contradictory terms are combined. For example: deafening silence, mournful optimist, blank copy. Some “experts” would want to add the phrase sustainable development to the above list of examples. Such critics of the concept of sustainable development also suggest that it should instead be termed as “sustainable de-growth”, since they believe that environment and development (or growth) are antithetical to each other; that is, environment degradation is the price that needs to be paid if development is to be achieved. Deteriorating environment is often linked with increasing economic activity, requiring deforestation, energy consumption etc. “Development” is usually held responsible for environmental damage, while environmentalists are accused of being “anti-development”! Even a popular economic concept, such as the “Environmental Kuznets’ Curve” suggests that environment degradation increases, with an initial rise in per-capita income, and later decreases with further development. However, to view environment and development as antagonistic terms is to have a very narrow viewpoint. Once the perspective is broadened, development and environment can be seen as complementing each other. 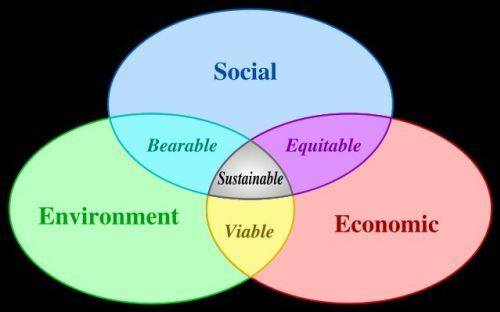 Sustainable development is a pattern of resource use that aims to meet human needs while preserving the environment so that these needs can be met not only in the present, but in the indefinite future. In other words, development that meets the needs of current generation without compromising the needs of future generations is termed as sustainable development (as defined by the Brundtland Commission). Thus, when development is viewed in terms of “quality of life” and not mere “numbers”, the complementarity between environment and development comes to the fore. To refute the notion that environment degradation is a necessary condition for growth and development, I suggest two propositions, which assert that environment and development can, and should exist simultaneously. Firstly, development can help conserve environment. Thus, both growth and environment conservation can be achieved together. Constructive intervention can help enhance the quality of environment; and development facilitates constructive intervention. Thus, development can not be provided as an excuse to hamper environment. In fact, progress in the field of science and technology has given us the tools to protect the environment. Efficient electrical appliances, fuel-efficient vehicles, better methods of recycling and waste disposal, the concept of green architecture and many other such techniques are all a result of scientific advancements, which have been made possible due to investment in the field of technology. Undoubtedly, technology has made us lazy and seemingly insensitive towards nature and environment, but no one can deny that technology alone has opened up possibilities of adopting a greener lifestyle. It is, therefore, our choice: whether we wish to use technology to conserve or destroy the environment. Secondly, environment degradation can ultimately lead to reversal of development. Thus, harming the environment to achieve “higher growth” is surely a risky prospect. Without a clean and green environment, development has no meaning. The starkest example of this proposition would be a person who earns a 7-digit salary, but suffers from respiratory diseases due to air pollution and hence has to spend a huge portion of her/his income on medical expenses! In addition, pollution and depletion of natural resources adversely affects livelihoods of all those who are directly dependent on the environment. Fishermen, cultivators, dairy farmers and many others are deeply affected by water pollution, soil contamination, acid rains, depletion of bio-diversity and other forms of pollution. Thus degradation of environment clearly affects employment and growth. Moreover, noted economist and Nobel Laureate Amartya Sen asserts that environmental plunder affects distributive justice, which is an important branch of development. Pollution is caused by the affluent classes (effluents from industries, vehicular pollution, wastage of resources etc.) but its ultimate effects are borne by the disadvantaged (scarce resources, contaminated water, poor air quality etc.). Sen strongly condemns this “disguised manslaughter”. This clearly highlights the fact that severe environment damage can retard rather than promote development, through its strong distribution effects. These linkages unambiguously underline the complementarity between environment and development. Without doubt, one can’t exist without the other. Surely, sustainable development is not an “out of reach” phenomenon. To achieve it, we just need some simple measures, common sense, practicality and sensitivity towards the environment. We need an integration of developmental and environmental concerns. Every society, at each level can contribute towards conserving the environment. The government can make intelligent policies and ensure strict implementation of the laws. In addition, a system of incentives and disincentives could be devised, aimed at protecting the environment. For instance, efficient appliances (CFLs etc) could be subsidized, while pollution causing vehicles (fuel-guzzling SUVs) could be taxed heavily. Educational institutions can also contribute by spreading awareness and internalizing the issue in young minds, with the help of NGOs. Enterprises can fulfil their corporate social responsibility by minimizing wastage in their offices, using efficient equipment and adopting environment-friendly production processes. At the individual level, simple steps like minimizing wastage of paper, water and electricity at homes, avoiding littering in public places and above all, being aware and conscious of environment issues can go a long way in repaying our debt towards the environment. To conclude, I would yet again assert that sustainable development is, by no means, an oxymoron. Instead, it is a phrase that needs to be incorporated in our lives at each level. It is an ideology that should be the foundation of government policies, if we genuinely wish to leave behind a clean and green Earth for our future generations. I agree with you that sustainable development doesn’t have to be an oxymoron. If more people took this wider view then perhaps we might see some progress where there has been little to date. I’ve been reading some of the essays in Agenda for a Sustainable America over the weekend, and find that the opinions and recommendations expressed give a view of sustainable development as a choice that can build the economy and protect the environment at the same time. Sustainable development is big term. Now a day everyone is using it on his own terms. Sustainability is things which ensure the development of all without creating/ generating any hazard, harm to environment & ecology. So before doing/ starting any things we have to think abut its terms, that how it will be sustainable, we have to chalk out the plan, indicator and monitoring system which will ensure the sustainability of the activity or action. The Kuznets curve and related arguments are something I buy, but we must realize that with the current pace of development happening, what options do we really have. Is it not true that environment clearances are but a sham, or that when taken seriously, are considered to be hampering the country’s progress?